Biography of Australian Impressionist Painter, Heidelberg School. A leading member of the Heidelberg School of Australian Impressionism (1886-1900), active in Melbourne, Victoria, the English-born artist Tom Roberts is regarded as the father of indigenous landscape painting in Australia. Trained in Europe, where he learned about the new artistic techniques being introduced by Impressionist painters in France and elsewhere, he returned to Australia in 1885 and became a pioneer of plein air painting in the countryside east of Melbourne around Box Hill and Heidelberg. In addition to his Impressionist landscape painting, Roberts produced a wealth of portrait art, notably his masterpiece The Big Picture (1901-4, Parliament House, Canberra). During the late 1880s, Roberts was a strong advocate for the development of a national style of Australian painting, based on uniquely Australian themes, and he urged fellow painters to leave the suburban bush and paint the national life of the country. Roberts himself painted several major works over the following years, including the iconic genre painting Shearing the Rams (1890, National Gallery of Victoria) which celebrated work and life in rural Australia. Among his famous landscape paintings are: Slumbering Sea, Mentone (1887, National Gallery of Victoria, Melbourne); An Autumn Morning, Milson's Point (1888, Art Gallery of NSW); and A break away! (1891, Art Gallery of South Australia, Adelaide). He also journeyed to Europe, where he exhibited with some success at the Paris Salon and the Royal Academy, London. Even though he was later eclipsed by his Heidelberg colleague and friend, the native Australian painter Arthur Streeton (1867-1943), Roberts is now regarded as the most influential pioneer of modern art in Australia. Other modern artists associated with the Heidelberg School of Impressionism included: Charles Conder (1868-1909), Fred McCubbin (1855-1917), Walter Withers (1854-1914), Clara Southern (1861-1940), and Jane Sutherland (1853-1928). Thomas William "Tom" Roberts was born in Dorchester, England, elder son of newspaper editor Richard Roberts, journalist, and his write wife Matilda Agnes Cela. At the age of 13, following the death of his father, he emigrated with his family to Australia, settling in the Melbourne suburb of Collingwood. Here, he developed an interest in art, studying (in 1873) at the Collingwood and Carlton Schools of Design under the Swiss master Louis Buvelot (181488), and (in 1874) at the National Gallery School in Melbourne. While studying, he worked as a photographer's assistant at Stewart's of Bourke Street, but he also found time to mix with other students, including the talented Frederick McCubbin. In 1881, partly sponsored by the Victorian Academy of Arts, Roberts returned to England where he trained for three years at the Royal Academy Schools in London - the first major Australian painter to be selected to do so - defraying his expenses by doing illustration work for the Graphic. In London, Roberts was influenced by a variety of regional artist-groups like the Newlyn School (1884-1914), by the Aestheticism of Whistler (1834-1903), and by the naturalism of artists like Jules Bastien-Lepage (184884) and his English followers. In 1883, he toured Spain in 1883 meeting the Catalan modernist Ramon Casas (1866-1932), from whom he absorbed the basic Impressionist painting techniques. He followed this in 1884 with a painting trip to Venice where he made a series of rapid oil sketches of the lagoon, in an Impressionist style. Roberts returned to Melbourne in 1885, and immediately began working to establish a new school of plein air painting, so as to pictorialize Australian life, culture and character. His determination made him the effective leader of the group of painters who were later christened the Heidelberg School by the art critic, Sidney Dickinson. They set up artist camps - at weekends and holidays - at Box Hill, Heidelburg and Eaglemont, and made trips to seaside suburbs like Beaumaris and Mentone. Please Note: In general, the Heidelberg School painters combined Impressionism and Naturalism in a slightly more formal style than that used by French Impressionists like Claude Monet (1840-1926), Renoir (1841-1919) and Camille Pissarro (1830-1903). In August 1889, Roberts, Streeton, Conder and McCubbin staged the 9 by 5 Impression Art Exhibition in Melbourne, named after the size of the cigar-box lids on which most of the 183 exhibits were painted. The decoration of the exhibition rooms in red silk, along with the elegant flower arrangements, reflected the painters' desire to show their artwork in an Aesthetic and bohemian setting, similar to the chinoiserie, bric-a-brac, drapes, and flower displays at Roberts' own studio in Grosvenor Chambers, at the fashionable end of Collins Street. Not unlike the reaction of French art critics to the Impressionist Exhibitions in Paris, Australian critics were decidely unimpressed by the art on display. It was too casual and too informal, both in its themes and its execution. In 1891, with Melbourne experiencing a severe economic recession, Roberts followed Streeton to Sydney where the Art Gallery of New South Wales was supporting indigenous painters with its positive policy of acquiring Australian pictures. For three years in a row, beginning in Spring 1888, Roberts had visited Brocklesby station, near Corowa, New South Wales, to paint the sheep shearing process. He made about 80 on-the-spot oil sketches of the light, the atmosphere, the sheep, and the men at work, before completing the picture on location in 1890. The result - Shearing the Rams (1890, National Gallery of Victoria) - was considered an iconic image of the emerging national identity. Other similar paintings by Roberts included Shearing at Newstead: The Golden Fleece (1894) and Bailed Up (1895-1927). Roberts' portrait paintings of political, literary and artistic figures are just as important as his landscapes. More than half the oil painting he produced during the period (1885-1900) was portrait art, and while he would have much preferred to create historical works, even portraits were preferable to teaching. But in fact, after painting numerous public figures, including the likes of Sir Henry Parkes, G.W. Marshall-Hall, Major General Hutton and Alfred Hill, he became quite enthusiastic about creating a portrait-record of Australian characters. He also made a start on aboriginal portraiture. Beginning in 1892 on a trip to Queensland and the Torres Strait Islands, he painted a number Aborigines as individuals rather than tribal types. During this period he also attended to his personal life, marrying Elizabeth (Lillie) Williamson, a former art-student, in Melbourne, in 1896. They settled in Sydney, where Elizabeth had one son Caleb, born in 1898. 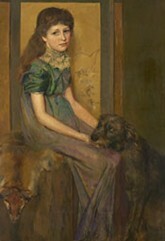 In 1900, Roberts exhibited a series of 23 panel-portraits from his collection of works. Roberts' dedication and articulate nature made him a successful organizer and advocate of the arts. In 1886, he was actively involved in helping to form the Australian Artists' Association, an alternative to the more old-fashioned Victorian Academy of Arts, and in setting up the Victorian Artists' Association in 1888, and was elected a committee-member of both organizations. He was also made Secretary of the Melbourne Art section of the Australasian Association for the Advancement of Science. After his move to Sydney in 1891, he became the founding chairman (1895-97) of the Society of Artists, which gave him access to the best circles in Sydney society, within which he worked tirelessly to promote the status of art as a profession. For an overview of the Imperial Age, see: Victorian Art (c.1840-1900). In 1901, Roberts was commissioned to paint the official picture of the first sitting of the Parliament of Australia in Melbourne. The work - The Big Picture (1901-4, Parliament House, Canberra) - was to feature more than 250 figures, in return for a fee of one thousand guineas plus expenses. In 1903 he sailed to England to complete the painting, but although it gave him financial security it failed to generate much more patronage. As a result, the ensuing decade in London was a particularly gloomy period for Roberts, whose portrait fees were barely enough to live on. He remained in London during World War I, serving as a hospital orderly in Wandsworth, along with several other Australian artists. Roberts returned to Australia in late 1919, holding exhibitions in Melbourne and Sydney, before returning finally in 1923. He and Lillie settled at Kallista in the Dandenongs, near Melbourne. She died of cancer in 1928, and he followed her in 1931, at the age of 75. Sadly, unlike his artist friend Sir Arthur Streeton, he was offered no honour, and despite his undeniable status as one of Australia's best landscape artists, it wasn't even until 1920 that the National Gallery bought one of his paintings. This snub - now seen by art experts as a travesty - was due to a number of factors, not least his forceful advocacy of the artist during the 1880s and early 1890s. 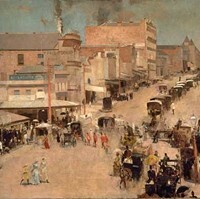 Paintings by Tom Roberts can be seen in many of the best art museums in Australia, including the National Gallery of Australia, Canberra; the National Gallery of Victoria, Melbourne; the Queensland Art Gallery, Brisbane; the Art Gallery of South Australia, Adelaide; and the Art Gallery of Western Australia, Perth. For more modern Australian painting, see Russell Drysdale (1912-81) and Sidney Nolan (1917-92).  For more details of Impressionist painting in Australia, see: Homepage.